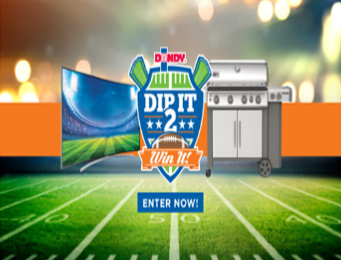 Dandy Fresh Fruits and Vegetables “Dip it 2 Win it” Sweepstakes – Win a 75″ Smart TV & a Weber Grill! Win Samsung 75″ Smart TV and a Weber Genesis II Gas Grill! ENTER SWEEPSTAKES HERE – Dandy Fresh Fruits and Vegetables Sweepstakes page. ENTRY LIMIT – Limit one (1) entry per week. ELIGIBILITY – The Sweepstakes is open and offered only to legal residents of the contiguous United States (not including Alaska and Hawaii) who have reached the age of majority in their state of residence at the time of entry. SWEEPSTAKES ENTRY PERIOD – The Sweepstakes begins at 12:00:01 a.m. Eastern Time (“ET”) on November 19th, 2018 and ends at 11:59:59 p.m. ET on January 23, 2019. PRIZES – There will be five (5) Second Prizes and one (1) Grand Prize. The Grand Prize Winner, upon the Administrator’s confirmation of eligibility, will receive one (1) Samsung 75” LED Smart TV from Duda Farm Fresh Foods and one (1) Weber® Genesis® II 435™ LP Gas Grill. Approximate Retail Value (“ARV”) of the total Grand Prize is $3,099. Each of the five (5) Second Prize Winners will receive one (1) Samsung 55” LED Smart Ultra HD TV. Approximate Retail Value (“ARV”) of the Samsung 55” LED Smart Ultra HD TV is $500.